Think about this as an album that you will share with others who never knew your loved one (Download the instructions). Tribute Page – the opening page in book. Pick out 3-6 of your favorite pictures and the tribute that you have written honoring your loved one, or write a new tribute. Four Gifts – you can do a single or double page for each gift. Celebration Page – last page in book. 3-6 of your favorite pictures Write a “Celebration” of this loved one – examples: “I celebrate the love you brought to life. The way you brought joy to every day.” etc. 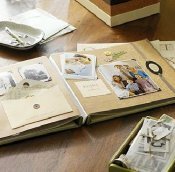 Continue to fill your Tribute Album with pages of photos, mementos, and things that celebrate the special gifts your loved one gave to the world. You may wish to elaborate on your loved one’s different roles, like Father, Brother, Friend, Husband. Or you may wish to share some of their hobbies and interests, like fishing, music, cooking on the grill. Consider including your loved one’s favorite football or baseball team, or NASCAR driver, if they were big sports fans. Allow your finished product to capture the multiple facets of your loved one, while sharing the story of their life. Most craft stores have whole sections devoted to scrap booking materials. You may add decorative items in your Tribute Album that specifically remind you of your loved one. The supplies are endless; decorative pages, papers, and journaling boxes, lettering, scissors, adhesives, and various tools to accomplish special effects. Below, under “Resources” you will find links to some providers who carry craft supplies. Debbie Hutt, Director of Donor Family Services, demonstrates how to create a Tribute Album page in the video below.